Looking for a wonderful herdsire to add to your herd? Look no farther! PJA Altitude's GreyHawk is here to WOW you! We will also entertain 1/2 interest with this awesome guy! 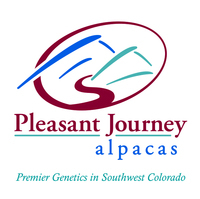 When breeding your herdsire to a female the intention is to achieve offspring that is as good or better than the parents. PJA Altitude's GreyHawk is just that! 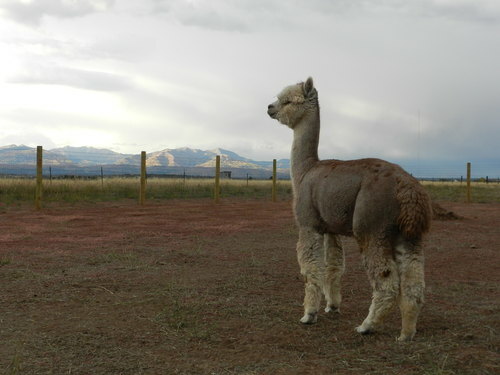 This young male has his sire's traits of presence, fiber and density. GreyHawk has a gorgeous full fleeced typey head. Now as a 4yr old, GreyHawk is showing he has what it takes to be an outstanding herdsire. He stands proud and tall like his sire, Adonnis' Altitude NS. Wonderful leg coverage, excellent density, crimp tail to topknot. Beautiful rose grey, almost spotless (just a few darker spots on back bone area) blanket with the tuxedo. 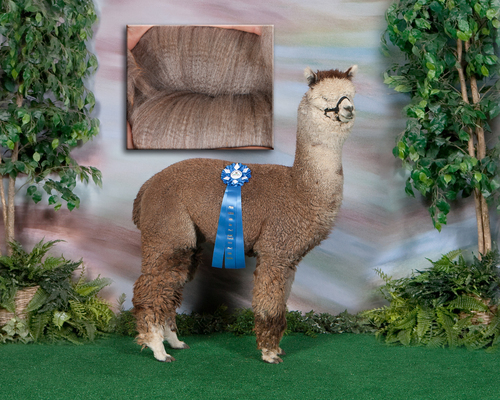 In the show ring it is consistently stated that he is very dense and has bright shiny, fine and consistent fleece! Born out of excellent lineage of Adonnis' Altitude NS and CCR's BonBon, GreyHawk holds superior genetics. ATV Adonnis, Mr Roosevelt, Crescent Moon's Rayo Del Sol, MGwire, Sinopsis Nocturna, the list goes on and on. Loads of show winning statistics behind this group! 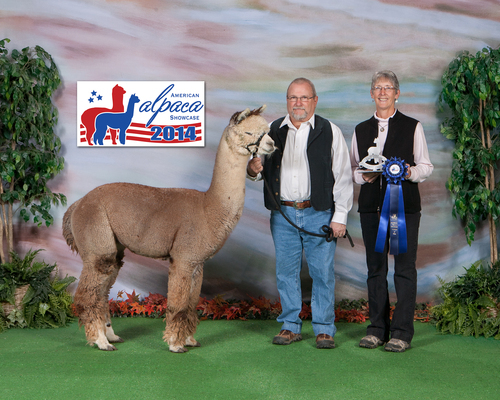 GreyHawk pulled a 1st and RC at American Alpaca Showcase 2014 and a 2nd place at FallFest 2014. Ths class of 8 2yr old males was among the toughest competition! **Update Feb 2015- 1st and RC at TxOLAN 2015!!! We are holding great hopes for this young male. Come see him at shows or visit our ranch and let's talk about what this future rose grey herdsire can do for your ranch and breeding program. 2015 will give us the first offspring from GreyHawk and yes, we are excited about the cria! We are currently getting a histogram on his 2016 shearing. We are offering 1/2 ownership of GreyHawk! With full ownership we will retain 4 breedings. 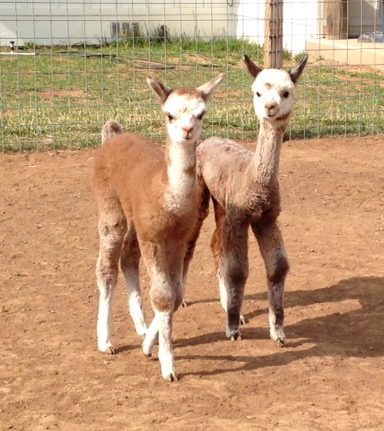 8/2015 GreyHawk's first offspring have hit the ground and they are both stunning rose grey! One male and one female - both dams grey. This guy is going to make us very proud! 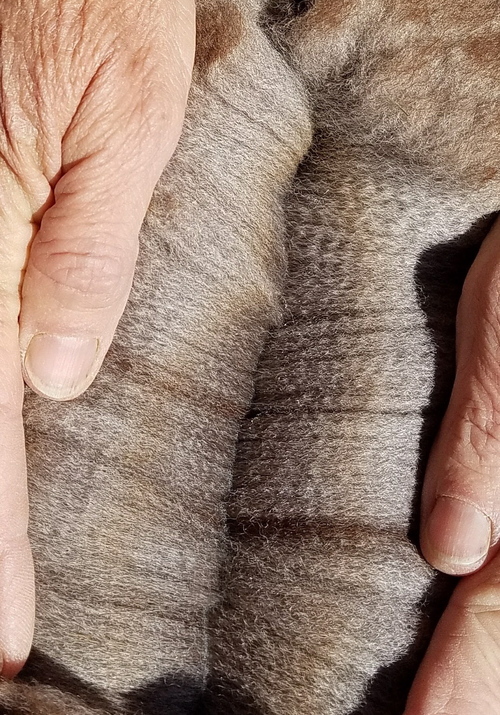 First Place 2014 TxOLAN - Cathy Merkley (class of 6)- fine fleece, consistent, great architecture, wonderful presence and substance of bone. 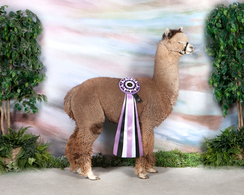 Reserve Color Champion 2015 TxOLAN - standing against 7! Financing available at 25% down, 0% interest for 24 months.